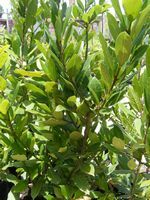 Bay, Laurel or Sweet Bay is an evergreen perennial shrub or small ornamental tree with glossy, dark green leathery leaves. There are male and female trees and both bear small, creamy-yellow flowers in small clusters, which develop, in the case of mature female trees, into black fruit, resembling small olives. Bay is native to the Mediterranean and can grow from 3 - 10 meters. In hot, dry climates Bay must be planted in partial shade. In cool climates with temperatures at night above 5 Celsius, Bay must be planted in a sunny position, sheltered from cold winds and frost. In cold climates, Bay must be grown in a container — where it becomes pot-bound and stunted — and be protected in winter. In cool and cold climates Bay must be pruned into shape in spring. In warm climates it must be pruned in autumn. The Greeks and Romans associated Bay with wisdom and glory. Bay leaves were fashioned into laurel crowns and worn by emperors and heroes in ancient Rome as a token of great honour. Up until recently the Grand Prix winner was honoured with a laurel wreath. In days gone by, they believed that Bay gave protection from lightening and it was considered a source of protection against all the evils of Satan! Bay leaves can be picked throughout the year. Bay berries are picked in autumn. Dry Bay leaves slowly, away from direct sunlight. Stored in a glass jar, out of strong light, Bay leaves can be kept for years. To keep Bay leaves flat — dry them between 2 sheets of paper in a heavy book or in a flower press. Bay leaf is a popular spice and flavouring ingredient in classic sauces, cuisines, seafood, poultry, meat, rice, soups, casseroles, marinades, pickled food, vegetable and sweet dishes like custards and creams. Bay leaf adds a warm pungent flavour to grilled or barbecued kebabs – push one or two leaves onto each skewer between chunks of meat. Never use fresh Bay leaf in cooking. Use Bay leaf sparingly. Remember to remove the Bay leaves before serving as they are tough to eat. Bay is used mainly to treat upper digestive tract disorders. Bay stimulates the secretion of digestive juices and promotes the digestion and the absorption of food. Bay assists in the breakdown of heavy food, especially rich meat. A weak infusion (tea) of the dried leaf taken with meals, improves digestion. 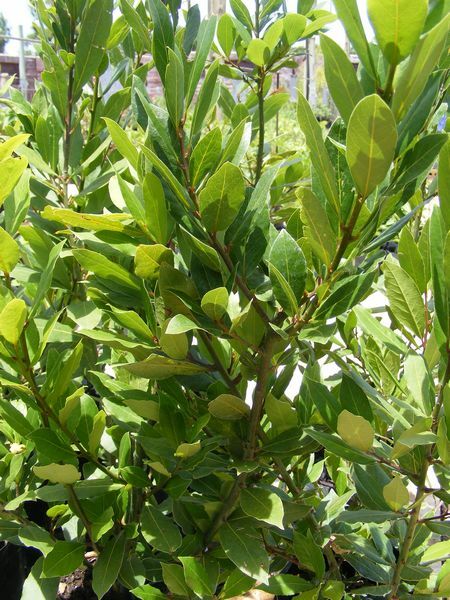 Dilute bay laurel essential oil in a suitable carrier oil and rub onto rheumatic/sprained limbs and bruises. Add an infusion of Bay leaves to a bath to ease aching limbs. Pulped fresh Bay leaf can be applied as an astringent to burns and bruises. A Bay leaf placed in a jar of flour or rice will deter weevils. Place the herb in a container with a lid. Pour the boiling (just of the boil) water over the herb. Cover and stand for 5-15 minutes. Strain. Add sugar or honey if necessary. Use as a drink, taking 1 cup daily hot or cold (per advice of the doctor or herbalist).